Our dining room is nearly “complete”. Design is never really complete, but we are nearly to the point that all major things are in place until the next fancy strikes us. The living edge table has been refinished, curtains hung, overdye rug in place, and you even got a sneak peak of the artwork on my Happy Thanksgiving post. Okay, so I’m way behind on updating, but as I’ve mentioned, I raised my white flags a little after Thanksgiving to focus on Birthday/Christmas/Birthday (when we have 2 kid birthdays & Christmas all within 3.5 weeks). The kids were so excited this year that I went with it and did everything big – imagine that: me, doing something big. Anyway, I was inspired by a friend who had hung sweet botanical prints in her home. She found many of them in books and thrifting. They look great in her home, and I wanted something similar but with the feel of our home. That’s when I stumbled upon a beautiful bird print that is part of the collection of the Audubon Society. That’s right, the group for all things birds. 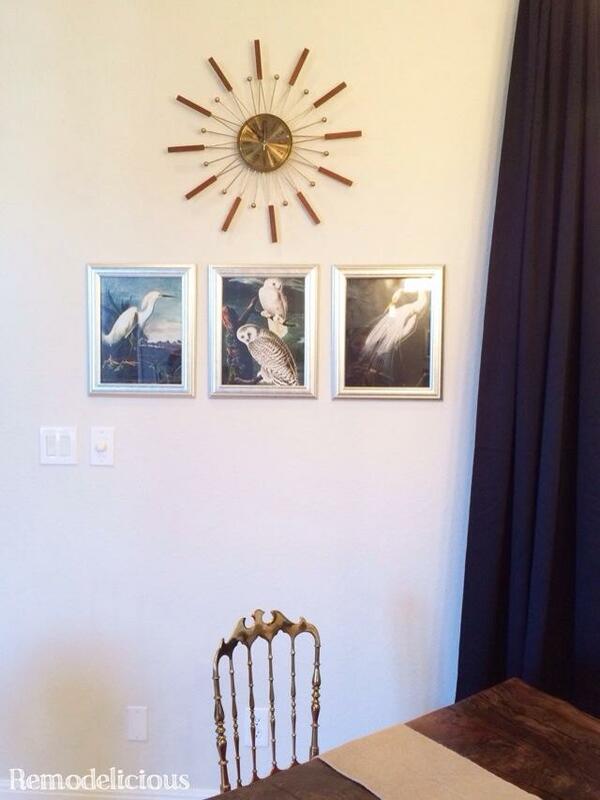 I’m not a member or a bird fanatic, but I do love bringing natural elements and art into our home. The dining room opens to the living room where I’ve decided to incorporate a lot of mixed metals. I’ve always loved chrome/silver tones and I’m working on ways to make them play nice with my brass family heirloom & mid-century treasures. 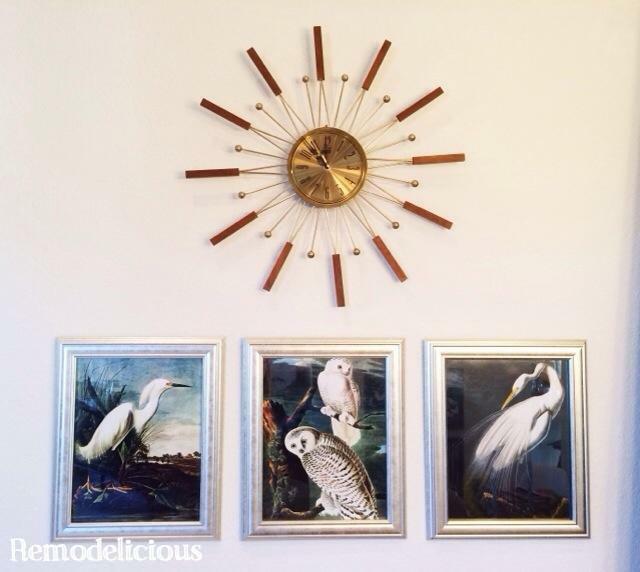 The wall was the perfect scale for my grandmother’s mid-century modern “atomic era” brass and teak clock… one of those treasures I mentioned. I mixed it with some silver-toned 11×14 frames from Michaels. I picked these up when they were having a 50% off sale on frames and were offering a 20% off your entire purchase coupon and got a great deal on them. They are bright and modern with clean lines and some detail to them. Perfect for our home. There’s something about sets of 3 that makes me happy and the scale of 3 of these together was perfect for the space. I did a Google Image search for “Audubon prints” and used the search tools to filter the results to include only those of a decent size for printing, then sent them to the quicky 1-hour photo printer. 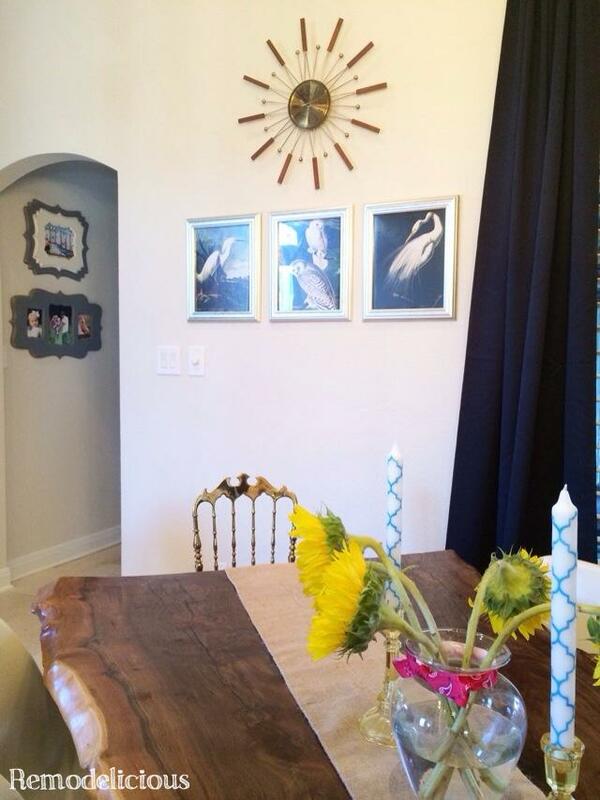 I picked the images with the colors in our home, predominantly blues and whites. They tie in great with the navy blue IKEA curtains. Psst – There’s a little sneak peat of another new feature in the dining room, more on that tomorrow! And here’s a wider shot with flowers left-over from Cora’s farm-themed birthday party, my reproduction depression glass candle stick holders, and some fun candles I just found at Hobby Lobby. I love how the blues play so nicely with the golds & yellows. How’s that for dining room art on a budget?